Low Moss opened in March 2012. This prison’s design capacity is 784 and it manages male offenders on remand, short term offenders (serving less than 4 years), long term offenders (serving 4 years or more), life sentence offenders and extended sentence offenders (Order of Life Long Restriction) primarily from the North Strathclyde Community Justice Authority area. The facilities include a link centre where offenders are able to deal with matters relating to employment, housing, social work, throughcare addiction services, etc. as well as facilities to help offenders address their re-offending and support them to re-integrate back into the community on their release. The establishment replaced the dated prison accommodation that had previously occupied most of the site and had started out as a barrage balloon station at the beginning of the Second World War. After the war, RAF Bishopbriggs was used by the Royal Military Police as a training school. In 1968 the site was converted into a temporary low security prison. The original Low Moss accommodated up to 327 prisoners in mainly dormitory accommodation much of which was in the form of wooden buildings. The prison was closed in May 2007. The buildings were subsequently demolished and the site cleared ready for a new prison to be built. Construction started on the site in February 2010. Family Contact Officer 0141 762 9557 (The phone is not staffed at all times during the day, but there is an answer machine service so please leave your name and contact details and we will get back to you as soon as possible). Agents Visits 0141 762 9558 (Opening Times: Monday to Friday 08:30 to 12:00 hours and 13:00 to 16:00 hours). Please note that there is no option to leave a message. Bishopbriggs is connected to the M80 by Junction 2.The main road through Bishopbriggs is the A803 which connects Glasgow to Falkirk. 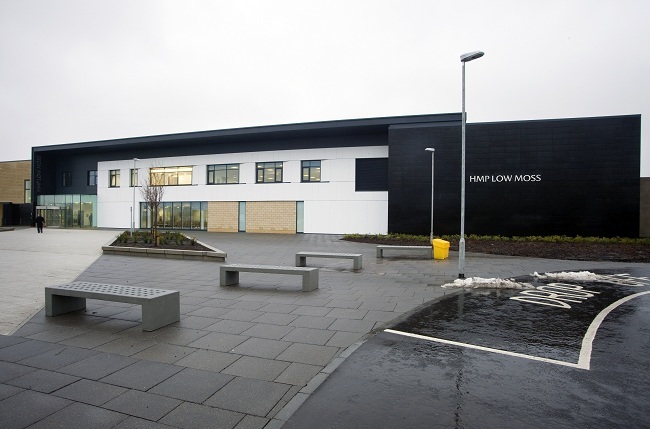 Low Moss is situated on B819 (Crosshill Road) approximately 0.5 mile from Strathkelvin Business Park. Low Moss can be accessed by approximately a 35 minutes bus ride from Glasgow Buchanan Bus Station, Service number 88. The stop is located outside the prison on Crosshill Road and a 2 minute walk from the prison entrance. Low Moss can be accessed by train via the Glasgow/Edinburgh line. Bishopbriggs Rail Station is just a short bus ride away from Low Moss via First Glasgow 88. The stop is located outside the prison and a 2 minute walk from the prison entrance. As part of the Family Strategy HMP Low Moss have updated their visits timetable, which will go live on Monday 13th March. Visits can be booked using the normal booking line. No amendments will be made to visits out with a 48 hour period. All visitors are required to arrive 15 minutes prior to the visit starting. Any person who arrives after the visit has started will be offered a closed visits providing they are no more than 15 minutes late. Any person who arrives more the 15 minutes after the visit has started will not be permitted entry. All visitors will be photographed on their initial visit and the officers will check that visitors have pre-booked a visit for the appropriate time. Once a visitor has been photographed there is no requirement to provide photographic ID for further visits however proof of address will still be required. Staff will ask visitors to deposit belongings, including handbags, in designated lockers in the atrium area (£1 coin is required for the locker). Visitors will be asked to remove outer clothing and this will be put through the x-ray machine (Outdoor jackets are not permitted in the prison). After walking through the metal detector visitors can then go through to the family and friends waiting area where they will be seated until it is time to move into the visit room. Within the family and friends centre there are drink and snack vending machines. Items from these machines can only be consumed within the family and friends centre and cannot be taken through to the visit room. There is a Tea Room located within the visits room where visitors will have the opportunity to buy food and drink. A maximum amount of £20.00 can be taken into the visits room (coins only). Within the family and friends centre there are information boards on the walls providing information on support available to visitors and families. There is also regular attendance from external organisations which specialise in supporting families of those imprisoned and we also have a Family Contact Officer who is available to speak with any visitors on request. On moving into the visit room you will pass through the search area. Officers will ask all visitor to consent to a rub down search by an officer of the same gender as the visitor. If a rub down search is refused then a closed visit will be offered. At times the SPS dog unit may conduct passive searches prior to entering into the visit room. It’s nothing to worry about as the dogs are well trained and friendly and you will be given clear guidance by the handler. If you have any concerns at all, please talk to a member of staff. Visitors will remain in the family & friends centre until they are called for their visit. Should visitors have to leave the family and friends centre for any reason they will have to be processed as a new arrival if/when they wish to return. Low Moss can facilitate those who may require wheelchair access or who have mobility difficulties. If you require additional assistance please do not hesitate to contact us prior to attending. Once staff are satisfied that the correct identification and information has been given the visitor will be admitted to the visits suite. The design of the official visits suite ensures that all such visits take place within sight of staff however, out with hearing distance. This is to ensure the privacy of interviews taking place. Property for offenders can be handed in to the atrium providing you have the relevant pro forma that stipulates the date and time. It is the offenders responsibility to inform their visitor what they can hand in and when. Visitors will be issued with a receipt for the property. You can post in property for offenders, however the individual must have completed the relevant pro forma prior to the items arriving. Please address the parcel for the offender’s attention to the undernoted address (example below). We recommend that any parcel is sent recorded delivery to ensure a tracked arrival (cost incurred at the post office). You may deposit money (£50 maximum) for an offender at the atrium on your arrival to the prison. You must provide the offender's full name and prison number. A receipt will be issued to you. (If you are unsure, please ask a member of staff). If you are unable to travel to HMP Low Moss to hand in money, any other SPS establishment will accept handed in money (maximum £50) which can be electronically transferred to HMP Low Moss, however please allow additional time for monies to be processed. Monies can be sent directly to an offender, however we would strongly recommend using either recorded or special delivery (costs incurred at the post office). You can also send monies by cheque or postal order (again there is a cost incurred at the post office for the postal order). Both of these should be made payable to the Scottish Prison Service, however please note the offender's details on the back of the postal order or cheque.